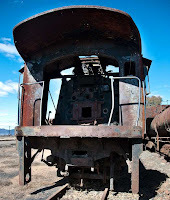 On 27 August 2009 we visited the locomotive graveyard at Queenstown station. The locomotives were guarded by a security firm. It is not a problem to view the locomotives. On arrival just report to the station master at the goods station and you'll be readily given permission. I could identify at least 19 locomotives from various markings on them. These identifications may not be correct, but do correspond with John Middleton's Railways of Southern Africa Locomotive Guide 2002. Apparently the scrappers had visited the site some time between 2002 and 2009, and a number of engines had been torched. It may be that there are more than 19 locomotives, but these are the ones which I could find on 27 August. NOTE 1. 693 received domeless boiler 8872 at some time prior to 1970 and therefore is a 19AR. May be SAR records never caught up with its status which is why the plate stayed as 19A. 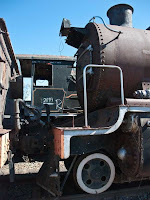 These two locos were stored together at De Aar in the 1980's and at some point (may be when their number plates were removed) painted numbers were mistakenly applied in reverse order ie: 685 became 693 and vice versa. I know that the Museum got confused as I remember discussing it with Alan Clark and I wasn't sure until a few years back when I physically checked the boilers on the two locos and realised the Millsite loco has the domeless boiler. In my 2002 book I had the classes right but the locations wrong the domeless 19AR (actually 693 with 685 painted on) is at Millsite and the 19A (actually 685 with 693 painted on) is at Queenstown. Therefore my question would be are the 685/693 plates at George original or re-casts. I think that at one point during the confusion the museum made some plates with 685 as a 19AR and 693 as a 19A. Hope this helps but its all a bit esoteric ! NOTE 2: In 2004 Dayle Coombe took some photos at Queenstown - these are posted here on sa-transport. Some of the engines, which Dayle identified at the site, have been torched since his visit. Click as usual on any thumbnail to get a larger view. Standing on the earth embankment of the dismantled coaling stage, this might be the scene. I have assembled this panorama to give an impression of the locomotives present. More locomotives out of view were on the line to the left. Following are some of the "out of view locomotives on the left". The following pictures were also taken from the embankment. Now we follow the long line of locomotives on the other line ..
HDR image to show detail in the shade. Hi my Name is PJ Edwards, and I would like to know how any person would go about purchasing one of these Locomotives and if possible who to speak to, concerning the purchase of a Locomotive in SA? My E-mail Adrress is pjmcfarlane@hotmail.com. A question In the 50's I travelled from CT to school in Queenstown by steam train. I cannot remember how long it took...1 day 1 night or two of each ?